There have been dogs throughout history that have fought in wars and crossed continents, been explorers and shown bravery that would be impressive if it had been demonstrated by a human hero. These exceptional canines are guaranteed to melt the heart of even the staunchest cat lover. Swansea Jack was a black retriever who lived with his owner William Thomas near the River Tawe in Swansea, Wales, during the 1930s. One day, Jack saw a small boy drowning in the river and ran in, pulling the boy to shore by the scruff of his neck. There was no one around to see it, and had circumstances been different, the boy would probably have spent the rest of his life telling the story to people who would never believe him. But Jack wasn’t done. Within a few weeks, Jack rescued another swimmer, this time with witnesses in attendance. And then another. And another. And so on. Over the course of the next decade, Jack was reported to have saved at least 27 people from, presumably, the most dangerous river and docks in Wales. Bamse was a Saint Bernard that served aboard a Norwegian minesweeper during World War II. Despite his cute and cuddly appearance—Bamse means “cuddly bear” in Norwegian—he was extremely tough. Bamse was originally brought on board by the ship’s captain. When the captain tried to take Bamse with him when leaving for another posting, the crew, who had grown fond of the dog, threatened to leave the ship if he was taken away. They loved the dog so much that they would have mutinied rather than lose him. Bamse became legendary in Dundee and Montrose, where the ship was stationed during World War II. He rode buses alone with a specially made bus pass tied around his neck, made sure that drunken sailors made it back to their posts, and allegedly put a stop to bar fights. Once, he rescued a crewman who’d fallen overboard by diving in to drag him to safety. He rescued another crewman cornered by a knifeman by barreling into the attacker and dragging him into the water. But Bamse was more than just a hero—he was also a peacemaker. It was reported that when sailors got into fights on board, he forced them to stop by standing on his hind legs with his paws on their shoulders as if to say, “Calm down, it’s not worth it.” And Bamse wasn’t just famous in Scotland, where his ship was based—every Christmas, he was dressed in a little sailor’s hat and photographed so that his picture could be put on Christmas cards and sent to the crewmates’ relatives in Norway. Awwww. Bob was born in South Australia in 1882, and for some reason he loved trains. He spent the early years of his life as a stray, following railway workers to work, until he was rounded up by a dogcatcher. It looked as if he was destined for the pound, but luckily for Bob he was bought by a kindly station guard who’d taken a liking to him. It worked out well, as his new master allowed him to ride the train with him in the guard’s van every day. But, eventually, his master got a promotion and he and Bob parted ways. Then Bob started to jump trains alone. Bob traveled up and down Southern Australia, becoming a familiar and welcome sight on trains across the land. Sometimes, when Bob felt that he needed some privacy, he chose an empty carriage and scared away any passengers who tried to sit in it by barking like crazy. The station masters and guards all knew him by name, so they left him to his own devices. At night he followed the engine driver home for a warm meal and soft place to sleep, then returned to the train the next morning. For most of his life, Bob went where he pleased, and as his fame grew so did his reception when he rode into town. He was allowed to attend banquets as a guest of honor, was given a special bracelet with his name on it—with an engraving telling anyone who read it to let him go where he wanted—and when he was seen riding on trains by local children they ran after him as if he were the Pope. Bob had many adventures in his short life and died the most famous dog in Australian history. In the 1860s, two stray dogs called Bummer and Lazarus were given the run of the city of San Francisco at a time when any other stray dog would have been rounded up and thrown in the pound. But Bummer and Lazarus were different—they were celebrities. The newspapers of the day reported their doggy exploits as if they were Posh and Becks or Brad and Angelina. If they got into a fight with rival dogs, the papers often printed an exaggerated account of it the next day, complete with eyewitness testimony and a dramatized cartoon of the event. Even Mark Twain took time out from working on Huckleberry Finn to write about them. The reason they were so beloved was due to their close friendship. Bummer started off as tough mutt who begged people for scraps, hence his name. When another stray arrived in the city and lost a fight, witnesses thought he’d be torn to shreds…until Bummer came running in to fight off his attacker. 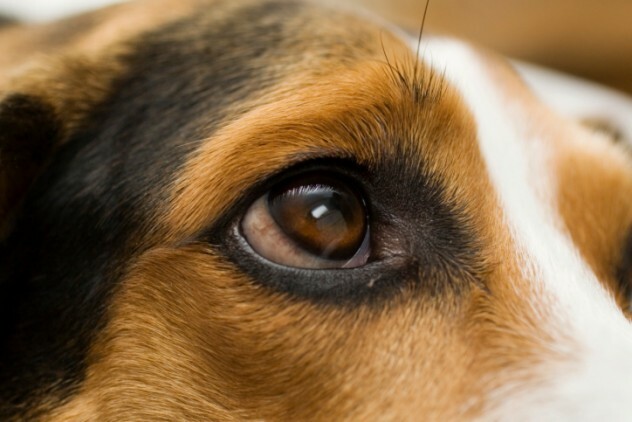 As Bummer nursed the injured dog back to health, it was given a new name—Lazarus. Their legend grew and every twist and turn of their friendship was reported on. When Bummer was shot in the leg and Lazarus didn’t look after him, there was uproar, with the whole city turning on Lazarus. This weird press fascination went on until both dogs died. And even after that, the coverage continued, with each newspaper accusing the other of publishing erroneous details about the dogs’ deaths. 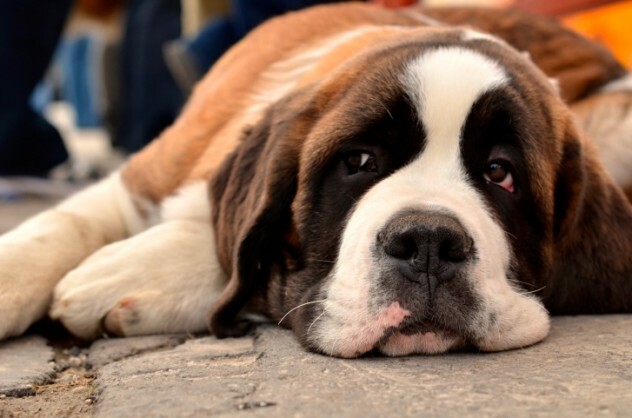 The Saint Bernard is a dog that was specifically bred for a single purpose—to search and rescue. Monks at the Saint Bernard Pass, a dangerous, snowy divide between Switzerland and Italy, bred them for hundreds of years—perhaps even as far back as 1695—to rescue travelers who got lost and buried in the snow. They traveled in pairs so that when they found a victim, one dog could dig them out and sit on them for warmth while the other headed back to the monastery for help. 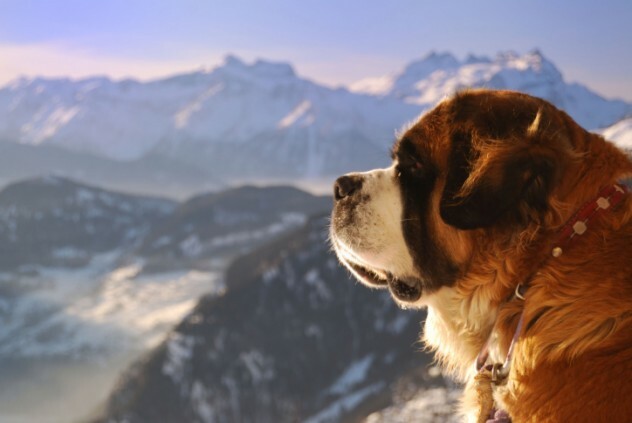 Which brings us to the second Saint Bernard on our list—Barry, who saved 40 people’s lives over the course of 12 years in the early 1800s. Barry’s most famous rescue was of a small child who’d become lost and trapped on a treacherous ice shelf. Barry managed to reach the boy, revive him, and keep him warm until rescue arrived. But even then, nobody could get to them. So Barry allowed the child to climb onto his back and pulled him to safety, inch by inch. Barry was so effective as a rescue dog that after his departure there was always one dog at the monastery named Barry—a tradition that persists to this day. Just one look at Bud Nelson is enough to tell you that he was the greatest dog who ever lived. He’s an old-timey dog wearing goggles in a scratchy black-and-white photo—if he hadn’t existed, he would have been dreamed up for a steampunk novel or Bioshock game. The human in the photo is Bud Nelson’s owner, a doctor called Horatio Nelson. Horatio was the first man to cross America by car in the year 1903, with his hilariously named co-driver Sewall K. Crocker and, of course, Bud. 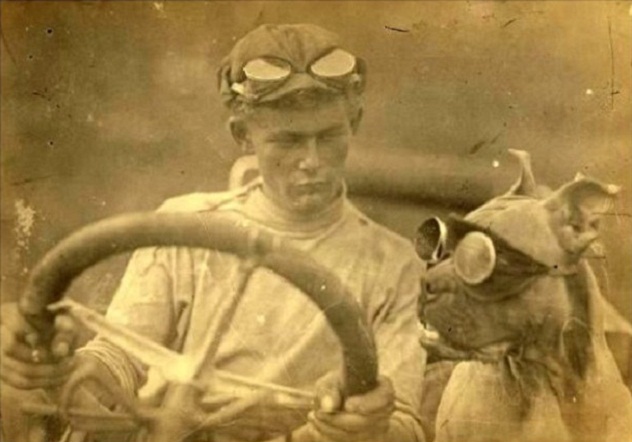 That made Bud the first dog to cross the United States by car. At the time, the automobile was still in its infancy, meaning that driving was neither safe nor fun. The car was a roofless monstrosity with little to no suspension to protect them from the mostly unpaved roads, and it would have made a lot of noise while belching out noxious smoke. But Bud Nelson was braver around the thing than some people would have been back then. He was given the goggles to protect his eyes and sat there looking just as happy as he does in the photo, all the way across the continent of North America. 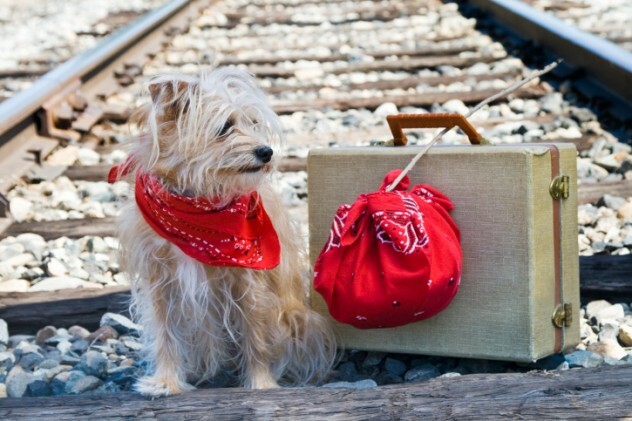 It’s generally believed that Owney’s original owner was a mail clerk because, just as Bob the Railway dog was obsessed with trains, Owney loved the scent and texture of mail bags and followed them by land, train, or boat wherever they went. 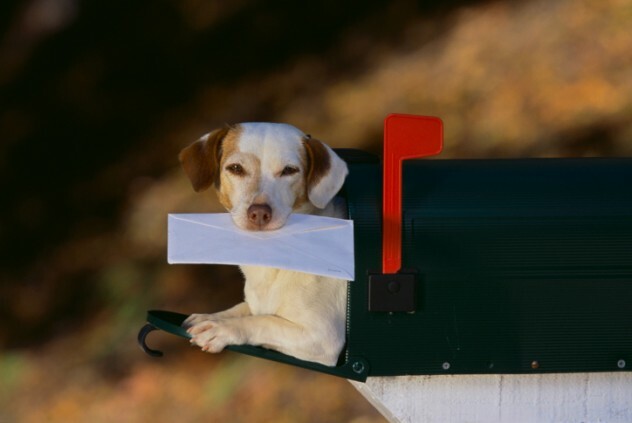 When Owney’s owner left for whatever reason, Owney stayed behind at the post office with his precious mailbags. After a while, Owney began to follow the bags, first in mail wagons and then on mail trains. He started to rack up miles, traveling through the county, then the state, and finally the whole United States. Mail clerks were happy to let him do this because they realized that no train Owney traveled on ever crashed, making Owney a good-luck talisman. So, they started to give him little trinkets and medals to attach to his collar to represent everywhere he’d been. When he’d traveled so much that that they no longer fit on his collar, he got a little jacket instead. As part of a publicity stunt, he traveled around the world on a 120-day-long, Jules Verne–style trip aboard an ocean liner. In this way, he traveled across America, Europe, and Asia, and all the way back. And just in case you don’t yet feel totally inadequate in the face of this small dog’s achievements, he also had his own postage stamp. In 1966, the World Cup was being held in England which, to the English, was kind of a big deal. Maybe the reason they were taking it so seriously was because they had a feeling they might win—which they did—so you can imagine how bummed they were when the World Cup was stolen just four months before the matches started. There was a frenzy to find the cup and avoid international embarrassment, and it was eventually found by a plucky collie named Pickles. 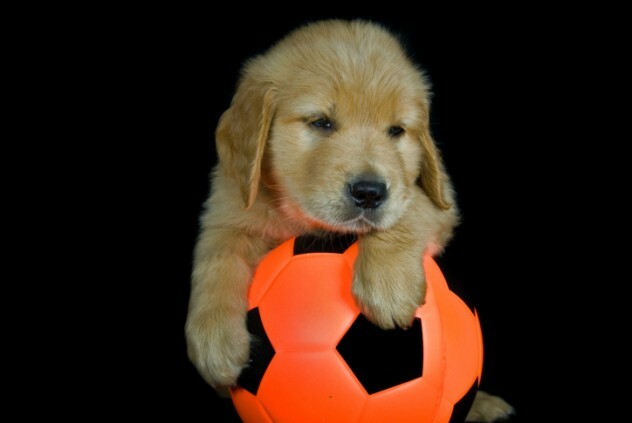 Pickles was being walked by his owner when he sniffed something out in the bushes—what Pickles had found was the missing World Cup. In the aftermath of Pickles finding the Cup, his rise to fame can only be described as meteoric. He was lavished with attention from the press as the hero dog who’d saved the nation from international embarrassment. Pickles even attended a banquet in his honor, where he was given a bone and a check for £1,000—archive footage shows the check being shoved into his face, so we hope it was cashed by his master and not chewed to shreds. He later went on to star in several TV shows and even the movies. Rolf was either the smartest dog in history or the center of a scam that fooled a nation—specifically Nazi Germany. Either way, then, he was pretty awesome. According to the Nazis, Rolf could talk. To put this into context, the Nazis backed a lot of hair-brained schemes during World War II, and one of the most hair-brained was trying to train an army of super-intelligent dogs to share their ideals. The smartest of these “super dogs” was Rolf. Apparently, Rolf was able to talk by tapping his paw against a board and using a sort of special dog Morse code to communicate with humans. It was using this code that he was able to converse, appreciate poetry, express his pride in the Nazi regime, and vent his blinding hatred of the French. Apparently, he even expressed an interest in joining the war effort and fighting on the front lines. We don’t expect you to believe that a dog could talk, but Hitler certainly did. He took a great interest in Rolf, and history’s greatest monster wasting time on the ridiculous notion that the Nazis had created the world’s first racist dog could only possibly be a good thing. 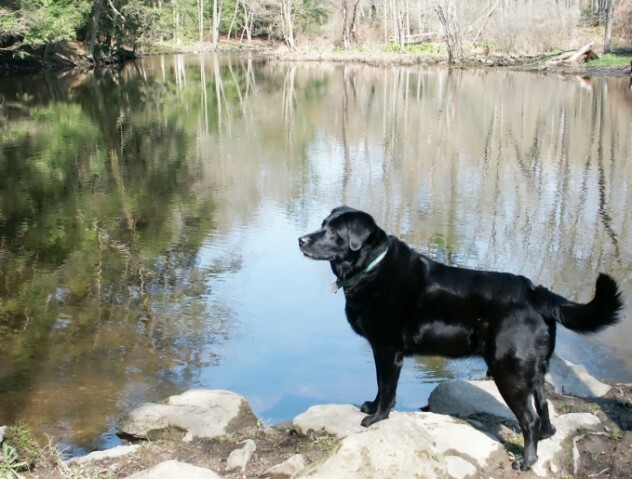 There are plenty of stories of dogs who stood vigil for dead masters for years afterward. Among the most well-known loyal dogs were Hachiko, from Japan, and Greyfriars Bobby, from Scotland. Hachiko and Greyfriars Bobby have had numerous books and even films made about them. But the loyal dog who was most famous during his own lifetime is probably the least well-known. Fido was born in Italy sometime during World War II. He was found on the verge of death by a kiln worker who took him home and nursed him back to health. And for this, he’d have Fido’s unwavering loyalty for the rest of his life. 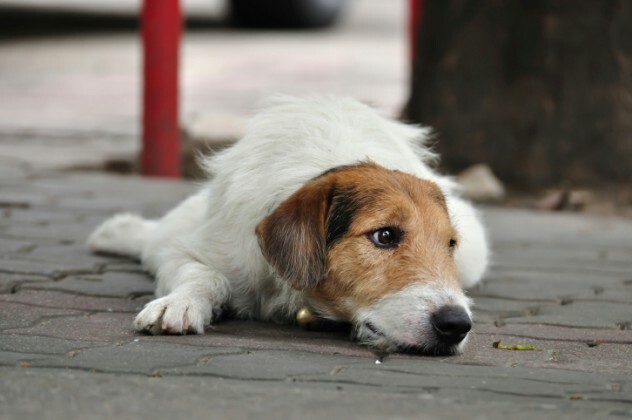 Every day, Fido waited for his master at the same bus stop, refusing to move until he stepped off the bus—and this at a time when Italy was being bombed almost daily. 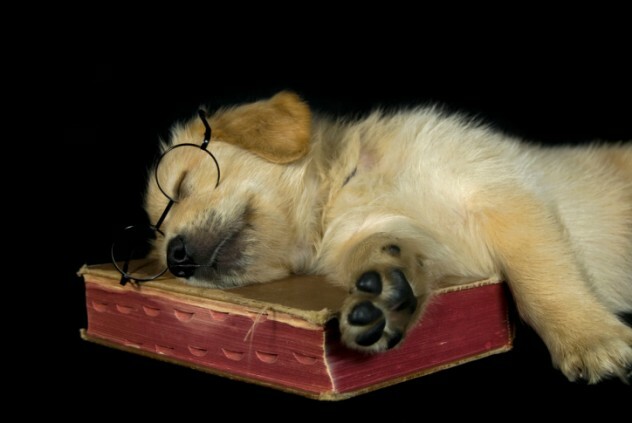 But one day, Fido’s master didn’t return. He’d been killed in an air raid while at work. Fido, ever vigilant, still turned up to wait for him. Every day. For 14 years. His tale spread across Italy until Fido became a constant source of media attention, both during the war and long after it ended. Surviving footage shows that huge crowds would turn up to watch him make his way to the bus stop every day, watch everyone get off, then walk away disappointed when the bus pulled off. He received honors and medals, but all he wanted was for his friend to come home. He never did. Don’t worry—it’s okay to cry. Aaron has written a few lists for Listverse and a dozen articles for Cracked.